Ultra-low energy consumption mini LED flood light with high intensity LED, waterproof aluminum housing, pre-wired cable and resistors for outdoor use in home, auto/car and garden lighting projects. This LED product was designed to impress: Super bright, ultra-low in energy consumption, waterproof even ok to be fully submerged for years of underwater brilliance and in 6 color options: red, green, blue, orange, warm white, and white. The high intensity mini flood light comes with about a meter cable, so there is no need to get your soldering iron hot. Its high powered LED operates on 12 Volt. Make sure you fuse it if connected to a solar energy source or car or even boat battery, or use one of Oznium’s LED drivers. This particular flood light has a super wide beam angle of 120 degrees, and if you are looking for a more narrow option make sure you check out its sister-product, the high intensity waterproof mini spot light which provides a rather narrow 25 degree beam angle. We strongly recommend this product for all sorts of boat & marine lighting, on use of cars, motorbikes and camping trailers, and of course for commercial lighting as well as garden & landscaping. Can these be hooked up to an RGB controller and have the same basic (strobe, flash, fade, etc) functions as an LED strip? No, because these don't come in RGB. Do you think you will ever make let's say a 3 or a 5 watt spotlight with a 45 degree angle? Yes, we just launched the new Oznium Eclipse LED light which might excite you as much as us. Do you make them in UV? If not, will you? We do not make them in Ultra-violet, but we could. Contact us for custom orders. How many amps does 1 flood draw? About 0.5 Amps. Good LED solution which covers a failry large area with even distributed light (nice wide beam angle). What a little gem of a product. Used them instaed my halogen downlights on a battery while having a power shortage the other day and got about 50% of the light an old 100W does. What a trick. Will not only order more for the next power crisis but look into replacing my entire downlights in my home. I use 5 of them in my maintenance room of the house where the geysers, gas bottles and the generator is stored. Used to have a 300Watt flood light there, and now down to 5x 1 Watt. Cost saving of about factor 60? Simply blown away. Can I connected this mini flood light directly to 220V? No, please, stop!! This amazing 1 Watt mini flood light would be completely fried if connected to 220V. Make sure you use a fuse if connected to a e.g. car battery, or just simply buy one of our dedicated LED drivers. What is the lumen output of the LED for a typical current? About 70 lumen that get amplified through the glass prism. 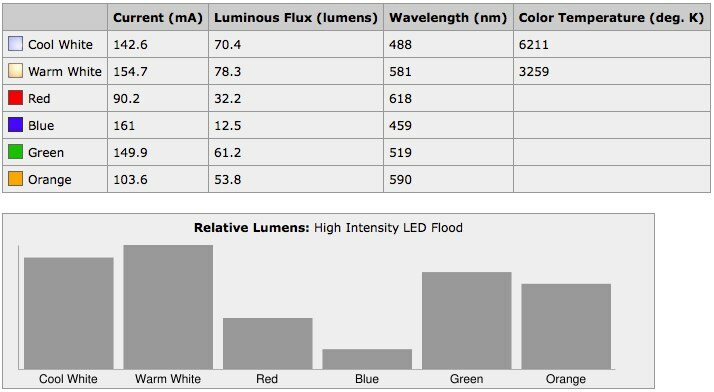 Check the color lumen chart on your left! How hot does the LED get? About 50 Celsius, depending on room temperature. Since the mini flood light is waterproof, perfect for outdoor use.